I used the SweetStamps Poppy Garden image on this card and I tried out a new product named Color Burst and had a great time coloring the poppies and creating the background. Color Burst is a powder in a small bottle and when it hits the water it will burst into color so if you aren't a pro at watercolor this product make it look like you're pro. See a video here. The image is heat embossed with detail black powder, this does help stop the flow of water from the background onto the blossoms and I didn't wet the blossoms until after the background was created. Rather than blow the powder onto the paper I placed it in a paint pallet and picked it up with a wet brush to avoid getting the powder on the flower petals. A tiny bit of powder goes a long way! 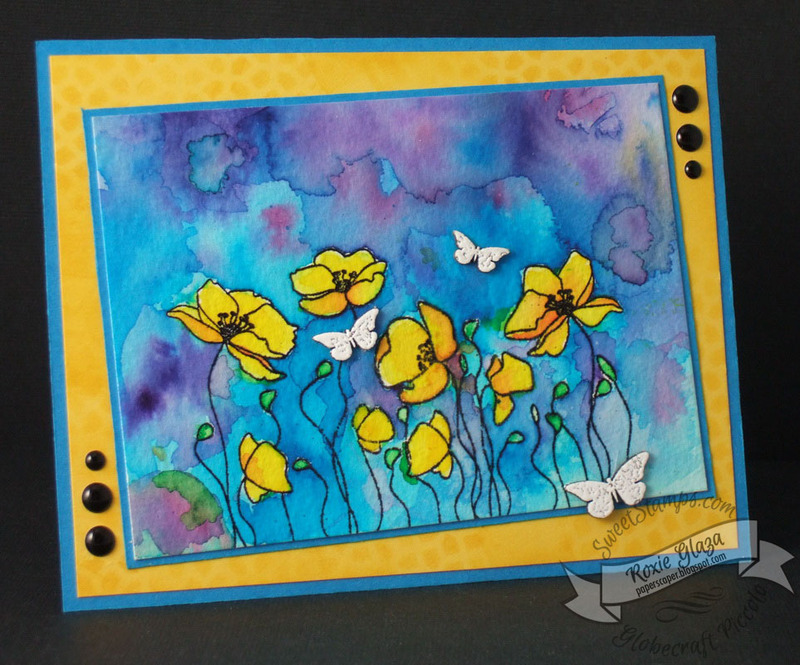 The yellow panel was sponging with the ATC Mini Art Stencil - Stained Glass by moving it around the panel as I sponged with Ranger Distress Ink - Mustard Seed. The small butterflies are from Globecraft and Piccolo and they are heat embossed with the Micro White powder then attached to the card with Aleene's tacky glue. Gorgeous design, it's so bright and sunny and I love how the yellow flowers look against the watercolor background. WOW this is gorgeous, I love the watercolored background and the bright yellow flowers! Floral Tags Made from Stencil!